SCVHistory.com LW2753d | Melody Ranch | Billy Curtis Stars in 'The Terror of Tiny Town' (Placerita Canyon 1938). "The Terror of Tiny Town"
Our hero Billy Curtis (1909-1988) gives his captor the evil eye in this scene from 1938's "The Terror of Tiny Town" from Columbia Pictures. Principal shooting was done at Ernie Hickson's Placeritos/Monogram Ranch (later renamed Melody Ranch) in Placerita Canyon. The following year, Curtis played the Munchkin City Father in MGM's "The Wizard of Oz." About "The Terror of Tiny Town"
Long before the term "politically correct" entered the lexicon, Jed Buell and his troupe of Little People made a serious Western — not the spoof you might have expected — in Placerita Canyon. The year was 1938 and Trem Carr and Ernie Hickson had just moved their Western movie town up the road to the present location of Melody Ranch two years earlier. They had started leasing it to Monogram by this time, but several other companies filmed there, as well. If some of the voices in this all-midget cast sound familiar, that's because a year later, many of them landed roles as "Munchkins" in a better known picture starring Judy Garland. The hero of our film, Billy Curtis, was the Munchkin City Father. Early in our film we see George and Olive Brasno, a real-life brother and sister performance act from New Jersey who went by the stage names Colonel Tim and Lady Tiny (and other names). The Brasnos passed on a chance to appear in "Oz," believing, probably correctly, that they would make more money staying in vaudeville. You might notice that some of the cast members speak German. That's because several of them were in (Leo) Singer's Midgets, a troupe from Vienna that moved to the United States after the outbreak of World War I. 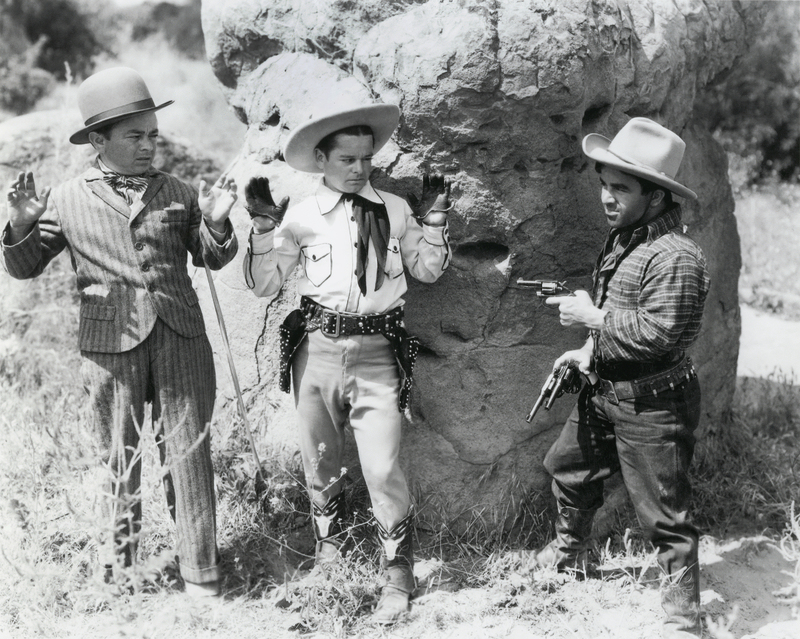 If "Tiny Town" holds together as a serious Western, that would be credit to its director, Sam Newfield, who churned out countless B-Westerns in the 1930s and 1940s featuring the likes of Ken Maynard, Bob Steele, Tim McCoy and Johnny Mack Brown — many of them shot in Placerita Canyon. As for Buell, he got his start in the Mack Sennett studio and in 1937 cast an African-American big band singer named Herb Jeffries in his first leading role on the silver screen. Filmdom's first black singing cowboy, Jeffries holds his rightful place on Newhall's Walk of Western Stars. A final note about our hero Billy Curtis as Buck Lawson. Curtis (1909-1988) had an active film career that lasted until his death. His TV credits stretch from the "Batman" series to "Laverne & Shirley," and in film from "The Incredible Shrinking Man" to "High Plains Drifter" with Clint Eastwood. Curtis shunned roles that were demeaning to little people, and taken at face value, the "Tiny Town" script plays it straight. But that's not to say the studios played it straight. Movie posters proclaimed, "Half-Pints in 10-Gallon Hats!" and Curtis didn't like it when the audience laughed. He was once quoted as saying, "I played the good guy who put the bad guy behind bars at the end, just like John Wayne. And I kissed the pretty girl, just like he did. So what the hell's so funny?" LW2753d: 9600 dpi jpeg from original photograph purchased 2014 by Leon Worden.